Komodo monitors, commonly known as Komodo dragons, are the largest lizards in the world. It is vulnerable due to a small range, encroaching human populations, poaching, volcanoes, earthquakes, and tsunamis. The Minnesota Zoo is active in the Komodo Dragon Species Survival Program, through which zoos collaborate to maintain a genetically healthy captive population. Get more information about Komodo Dragon. Please sponsor the Komodo dragon with you gift to Minnesota Zoo Foundation today. Your tax-deductible gift will help provide quality care for all of the amazing animals at the Minnesota Zoo. 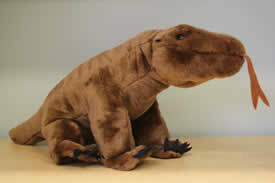 A 12” plush Komodo dragon. A Komodo dragon trading card with a photo and fun facts.